Far better known as a mountain biking trail, this is actually one of the most botanically interesting trails in the Western Cascades. Plants from both the California floristic zone and the northern flora mix here, and subalpine species mix with those found normally in the Valley. 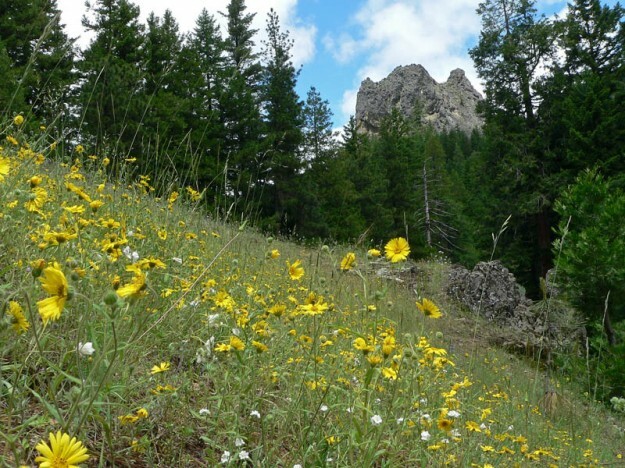 Many unusual species can be found along this trail as it climbs a ridge through old growth Ponderosa pine forest through a series of small meadows before arriving at the base of the statuesque pillar rock that gives the trail its name. The trail continues on through the forest past a number of small creeks, eventually joining with the Moon Point trail. For plant lovers looking for a medium-length trail, the middle section is recommended, or you can do the upper section from the Moon Point trailhead. The lowest section is less interesting botanically but still pleasant on a sunny winter or early spring day. Take Highway 58 2 miles past Oakridge to Kitson Springs County Road. After .5 mile turn right onto Rd 21. Follow Rd 21 for 18.7 miles around the reservoir to Rd 2129 (Youngs Creek Rd). Turn left on 2129 and continue for 3.2 miles. Park along the side of the road by the now-bermed-up spur road 435. Walk 0.1 mile up the old road until you come to where the trail crosses the road and there is a small parking area on the right. Head to the left to reach Youngs Rock. For the lower section do not turn up Rd 2129 but instead continue 2.6 miles along Rd 21 to the Camper’s Flat campground. Park in the campground. The trail starts on the other side of Rd 21.